Ireland's capital Dublin is not that big and you can easily walk everywhere. 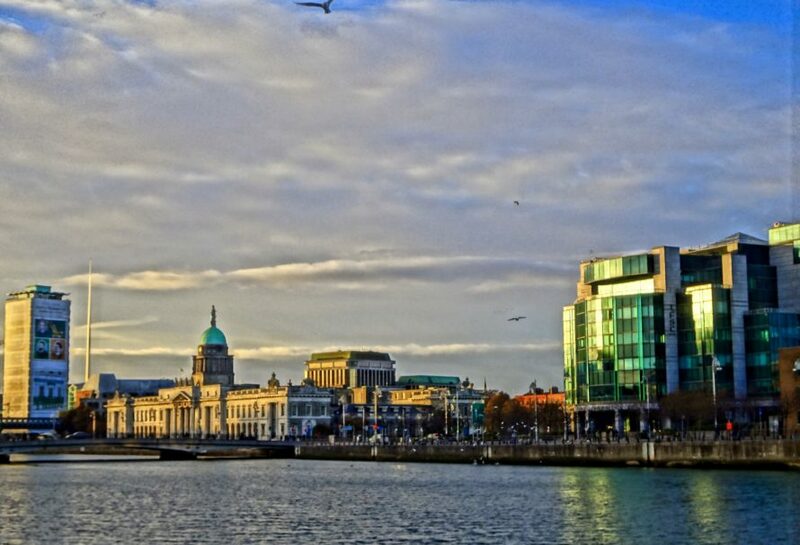 However, if it's your first time in the city and you are in Dublin for a short visit only, it can be tough to decide where to go first. The first thing you should get your hands on in order to get the most out of your day is a Dublin Pass. This will not only help you decide where to go and which attractions to see, but also save you a lot of money. You can easily order this pass online and then pick it up from the tourist office in Dublin. For adults, the pass currently costs 59 Euros for one day. But with special promotions, which happen quite regularly, the Dublin Pass costs even less. I got myself a one‐day pass and although it was already a bit late when I picked it up (around 11 am), I still managed to squeeze in most of the attractions listed on the Dublin Pass website. In the end, I saved 39.50 Euros with the Dublin Pass! I planned my sightseeing tour around Dublin strategically, so my first stop was the closest attraction to the Discover Ireland office where I picked up my pass (14 Upper O Connell Street, Dublin 1). The GPO Witnessing History exhibition is housed within Dublin’s General Post Office (GPO) for a good reason. Back in April 1916, the building acted as the headquarters for a handful of rebel leaders who initiated the so‐called "Easter Rising". This uprising, which was against British rule and demanded Irish independence, lasted several days. Even though the revolt was eventually crushed down by the British army, it paved the way to the establishment of Ireland as an independent state just a few years later. Film Tip: The Mini series Rebellion (2016), which tells the events of the Easter Rising in Dublin, is currently available on Netflix. Opened in March 2016 to mark the rising's centenary, there are a range of interactive highlights in the exhibition, such as a really cool film about the events. Next, jump on a Hop on Hop off bus to tour around the city. If you're lucky, you'll get Dublin Dave as your guide, who will share some incredibly entertaining stories, for instance about his two Irish grandpas. He will also point out some film locations. For example those of the 1996 film about the most famous Irish independence leader Michael Collins, who was portrayed in the film by Irish‐born actor Liam Neeson. You may also spot some locations of the other films that were shot in Dublin, such as Once (2007) or Sing Street (2016). By now, you should have got pretty thirsty. And since we're in Ireland, where drinking beer in the pub is an official pastime, there can only be one answer: The Guinness Storehouse! Conveniently, a visit to Dublin's Number 1 tourist attraction is included in the Dublin Pass, too. Even if you don't like beer, it's worthwhile to look behind the scenes of one of the largest breweries in the world. If you do like the taste of the dark Guinness beer, don't forget to grab your free pint at the top floor of the huge exhibition and enjoy the 3D panorama view of Dublin. From the Guinness Storehouse, you can easily walk to St. Patrick's Cathedral. Your bus guide will have already shared some insightful facts about the history of both St. Patrick's Cathedral and nearby Christ Church Cathedral. Now, you can explore them at your own pace, but I would recommend a quick visit only. After all, there is so much more to see today! Based on the reign of King Henry VIII (portrayed by Dublin‐born Irish actor Jonathan Rhys Meyers) and his six wives, The Tudors (2007–2010) used several filming locations around Ireland, including Christ Church Cathedral and Dublin Castle in Dublin as well as Kilruddery House and the Powerscourt Estate in nearby County Wicklow. Christ Church Cathedral provided the perfect backdrop for wedding, coronation and baptism scenes in the series. The crypt also currently houses a small exhibition showing some of the original costumes used for filming The Tudors. Take the spooky corridor from Christ Church Cathedral and you're right in the middle of another fascinating exhibition: At the Dublinia experience, you'll learn more about how the Vikings came to Ireland. 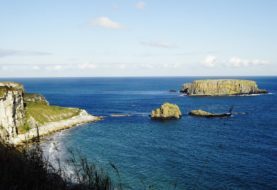 You will especially like this if you're a fan of the Vikings TV show and / or planning to see the Vikings filming locations on a half‐day trip to nearby Wicklow County. Dublinia is not only about the Vikings though. While you walk from room to room and from era to era, you'll get a really good overview of Dublin's long and eventful history. Next up is Dublin's National Wax Museum Plus. Contemporary Irish acting heros, such as Liam Neeson, Colin Farrell and Pierce Brosnan await among all those famous Irish faces that you will meet here. How times have changed! The Little Museum of Dublin hosts a historical advertisement for women to look "fuller"! Finish off your day of sightseeing at the Little Museum of Dublin. There are just a few rooms in this typical Dublin town house, but there is a lot more than meets the eye. Therefore, it makes sense that entry is by guided tour only. The tour guide (in my case called Patrick) will provide you with lots of insight about the history of Dublin and Ireland – such as the economic roller coaster ride that took Ireland from the poorhouse of Europe to one of the richest countries in the world and back to the poorhouse. On Thursdays, the museum stays open longer, so last admission is at 7 pm. On all other days bear in mind that the last guided tour is at 4.45 pm. After all that Power Sightseeing, it's time for a hearty dinner. Choose between traditional Irish pubs or modern world cuisine. Dublin has both. The Dublin Pass also gives you a discount off your food bill in a couple of selected restaurants. I picked the Asian fusion food chain Wagamama. So… how much did I save with the Dublin Pass? 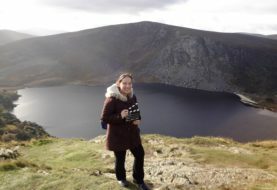 Although it requires quite a tight schedule, I found that the Dublin Pass was worth its 52 Euros, which I paid for it in 2016. After all, I would have spent 91.50 Euros had I paid for every single attraction separately. So that's a saving of 39.50 Euros! … if you're in town for a bit longer! Tip 1: The new Emigration museum EPIC Ireland is a must‐see for those interested in Irish history. It was opened in 2016, so at the time I did my sightseeing day in Dublin, it was not yet included in the Dublin Pass. It is now, however, so you can save yourself the entry price of 14 € if you visit the museum with the Dublin Pass. But: It is an extensive exhibition and there is a lot to see. Thus, I would recommend getting a 2‐day Dublin Pass , so you will have enough time to see everything the museum has to offer. Tip 2: Dublin's national museums, which house the country's greatest treasures, are all FREE to enter! 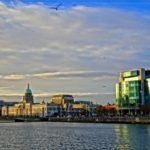 They include the National Gallery, the National Library, the Irish Museum of Modern Art as well as the National Museums of Archaeology, Decorative Arts & History and Natural History. Tip 3: Sandeman's FREE Walking Tour, which works on a tip‐only basis (give as much as you like), is great to get a first overview of the city. Dublin is an expensive city for accommodation and food, but in the summertime you can take advantage of the fact that the student residences let out their rooms to tourists. I stayed in Trinity College for a few nights, which couldn't have been more central and was also very budget‐friendly in comparison to other accommodation options in central Dublin. Walking around the campus of Trinity College felt a bit like walking through a Harry Potter set. As a film location, Trinity College has featured in Michael Collins (1996), The F‐Word (2013) and TV series Ripper Street (2012‐). Disclaimer: I receive a small affiliate fee, which I use for running this website, if you purchase a Dublin Pass after clicking on the links to the Dublin Pass in this post or if you book an accommodation through the link to Trinity College on booking.com.